In this project, digital voltmeter using pic microcontroller is designed. Digital voltmeter using pic can read voltage from 0-40 volt. This voltmeter can read only DC voltage. Digital AC voltmeter can also be designed using microcontrollers. 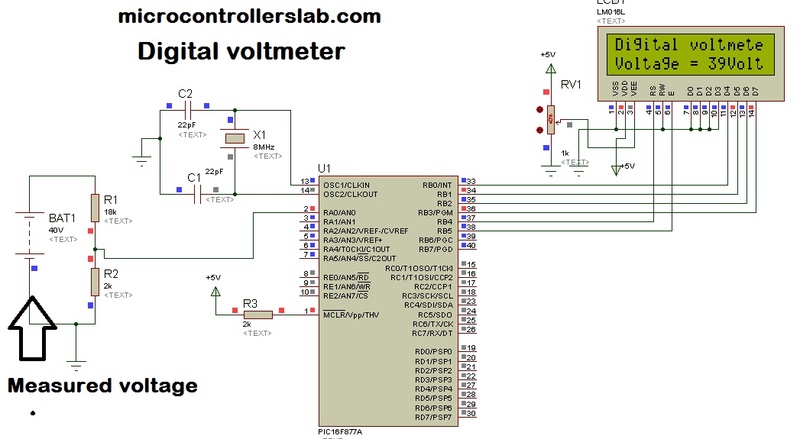 Digital DC voltmeter is designed to measure DC voltage using PIC16F877A microcontroller. Voltage divider circuit is used to divide voltage into two parts. To prevent more than 5 volt appearing across pic microcontroller Because microcontroller can not read voltage more than 5 volt directly. Liquid crystal display is interfaced with the microcontroller to display measured voltage value. Built-in analog to digital converter of pic microcontroller is used to measured analog voltage. circuit diagram of digital voltmeter using pic microcontroller is given below. 40 volt battery is used as q source whose voltage you want to measure. PIC16F877A microcontroller can not directly read 40 volt. Voltage divider circuit using resistor is used to step down dc voltage appearing across analog to digital converter pin of PIC16F877A microcontroller. Resistor R1=18k and R2=2k is used as voltage divider. According to voltage division formula, voltage less than 5 volt appear across pic microcontroller in the case of maximum input voltage 40 volt. Hence at maximum input voltage of 40 volt, only 4 volt appear across pic microcontroller which is less than 5 volt. PIC16F877A microcontroller has seven analog to digital converter channels. It’s means it can be interfaced with seven analog channels or it can measure seven analog quantities. In this project AN0 channel of pic16F877A microcontroller is used. ADC module of pic microcontroller converts analog signal into binary numbers. PIC16F877A microcontroller have 10 bit ADC. So it converts analog signal to 10 bit digital number which can be back converted into voltage using following calculation in programming of digital voltmeter. resolution is important to discuss here. resolution means value for which ADC increment by one. For example pic16f877A microcontroller have 10-bit ADC and it counts binary from 0-1023 for every minimum analog value of input signal. This minimum analog value is called resolution.ADC increment by one. For example pic16f877A microcontroller have 10-bit ADC and it counts binary from 0-1023 for every minimum analog value of input signal. This minimum analog value is called resolution. It means for every analog signal of 4.87mV, ADC value increments by one. Liquid crystal display is used to display values of voltage. As shown in figure below. Below diagram shows the result of digital voltmeter using pic microcontroller and LCD display. Statement one is used to read ADC value and stores its value in variable voltage and in second statement voltage value is multiplied with resolution factor and voltage divider factor to convert it into input voltage value. This digital voltmeter using pic can read voltage only between 0-40 volt. High voltage measurement voltmeter can also be designed using pic microcontroller and difference amplifier. Difference amplifier will be used to step down dc voltage instead of voltage divider. If I want volt show 100V . how can I calculate . Hi, what interface will I use to program the PIC 16F877A? Could you please help me and explain this part of code, and which part do i need to change and why ? please Mr.Bilal I need your help. may i have the source code ? Hello please How i can show 220V ? What is the use of the Oscillator circuit in the above circuit? bilal , pic has 8 adc channels not 7. you have mentioned that it has 7 adc’ s in the description part. sir the above project measure 0 to 40 volt. Could you please send me the .hex file for this project because i received an error when i try to complite the code in MicroC. I have make a test board with pic 16f877a and i am trying first to show on my LCD the message you have write at your code without success. There is no problem with my programmer as i have tested with another hex file and works properly. Could you please advise whats wrong? I am using all the options you have at your video and i have generated the hex file over the Micro C program (Micro C Pro). Your assistance is much appreciate. First of all, thank you for your detailed explanation, it is really useful. I’m trying to measure voltage across 2 DC sources in series using a PIC microcontroller. I need seperate measurements for each source. Would you please help me in that matter by showing me schematics on how it would be done. do you have same program which run on MPLAB software. If i need 1000 vot to show.